Google Project 10^100 (Project 10 to the 100th) - calls for ideas to change the world and offers $10m to make the best happen! Google have launched project 10100 ( 10 to the 100th) as part of the Google 10th birthday celebrations. Project 10100 is a call for ideas to change the world and Google will help make the best ones happen by backing them with $10m of funding. Deadline for submission is 20th October and voting for the best Project 10 100 ideas begins in January. Nice initiative and I hope that this gets lots of entries. I will now have a think and see what I can come up with - if I do manage to think of anything productive I will post it here! Then subscribe to regular updates from this blog - just click here! I agree...Project 10^100 is a great contest. I have submitted my idea. My idea deals with creating a more incentive-driven health system. Think about it: wouldn't you like to get paid for being healthy or be able to "trade" your health to other less healthy family members or friends. Sound interesting...then find out more at the URL website below (by clicking my name "Jonathan Barry"). Google is celebrating its 10th birthday. So planed to sponsor $10 million for best 5 ideas. You can login to YouTube using your Google accout.. Thank You ;)... Please recommend to your friends also. Video is very fast.. b'coz 30 min is allowed. So please use pause button to read all..
Google received over 100,000 ideas. Too bad only 100 ideas will be published by January 27th, 2009. 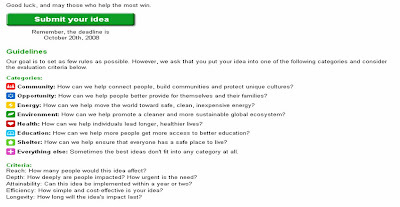 To make sure your idea can be seen, you can publish it on http://project10tothe100ideacollection.com to help the world. A multi-field project is becoming one of the most popular... It is in the areas of Energy (renewable), health (for paraplegics), environment and community. WOWS is an open society beyond politics with two main elements. The first is delegations from different cultures, religions, international organisations, countries and companies*. The delegates work together continuously. The working process can be followed and observed by internet users around the world. Monitoring, observation is continuous during the working hours as in a "Big brother-show". A delay is used in the broadcast of the "show" for security reasons. WOWS uses a system similar to that of the free online dynamic encyclopaedia: Wikipedia, to improve the efficiency of work. The information base will be approved by delegates. The other element of WOWS is the registered users who can access the database. The users also have a voting system through which they are able to determine (influence) the priority of a certain topic emerging during work. Without political reasons, what are the main problems? With the cooperation of people from around the world, what are the possibilities? -Ancient Knowledge & Science Today: What's behind the scenes? Are there so many secrets, or only a great one? There is a lot of reliable information on the internet about technologically advanced ancient cultures who had also advanced knowledge about natural healing, sacred geometry, etc. There are also so many publications and videos about UFOs and paranormal symptoms, etc. Is there any secret knowledge coded into different cultures? Opinions required from the delegates! -Technological Singularity, Human Cultural Evolution: The time for Technological singularity is here. * What we can do to be prepared? Economic aspects, potential dangers, accelerating change, human cultural evolution. Which is the best way to avoid conflicts? Opinions of religious people and scientists required! * Technological singularity is a theoretical future point of unprecedented technological progress, caused in part by the ability of machines to improve themselves using artificial intelligence. -Global Threats to life on Planet Earth: Dangerous meteors, comets, other celestial bodies, danger from the outer space. Information about 2012 required (the next end of the world theory).